No-Nonsense Noodles: Pho Bar is exactly as advertised — it’s a place where you go exclusively for your Vietnamese noodle fix, because why the pho not? Look & Feel: A long and narrow space consisting of an L-shaped bar and a few seats at the back, Pho Bar’s highlights are bright green accents and geometric motifs (read: pointy furniture). On the Menu: Pho, duh. There’s a daily special that you can ask the staff about, and three other options: rare beef filet mignon ($68), Premium ($78, with rare beef, beef balls, tripe, tendon, beef shank, Vietnamese sausage), and Supreme ($88, or Premium with oxtail and brisket). Sides like spring rolls and truffle fries (don’t ask) are also available. Service: You check things off a piece of paper, then hand it to the staff — not much service is really needed here. 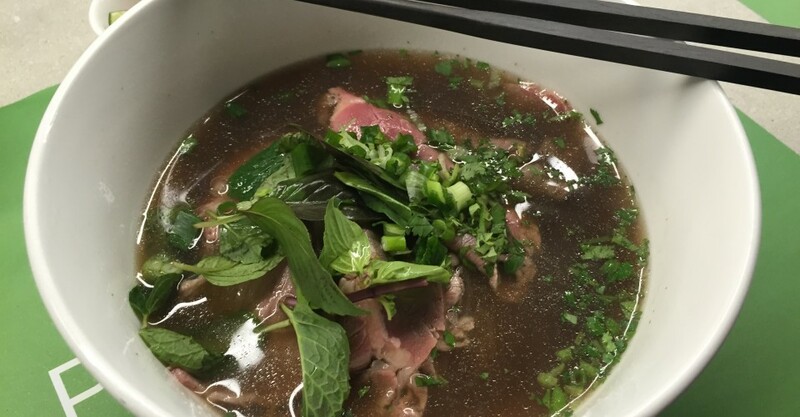 Jeng: The rare beef pho comes with a clean and sweet dark brown broth and tender pieces of pink-colored beef. Although the filet mignon has never been our favorite cut, it works here, if only because we care about the noodles and the broth that much more. You can top off your noodles with fresh Thai basil, bean sprouts, coriander, lime and red chilies. Not So Jeng: We had to make do with Thai gum been fun as the kitchen ran out of pho noodles (WTF?!). The only saving grace is it’s still velvety and delicious. But, come on, no pho noodles available at Pho Bar??! Are you serious bro? Great For: Satisfying a noodle craving, an in-and-out dinner. FYI: It might be a temporary quirk, but CASH ONLY for now.